With Thanksgiving just around the corner and the weather finally cooling down, we can’t seem to get pumpkin out of our heads. It’s just so iconic this time of year: pumpkin pie, pumpkin bread, pumkin-scented candles, you name it! 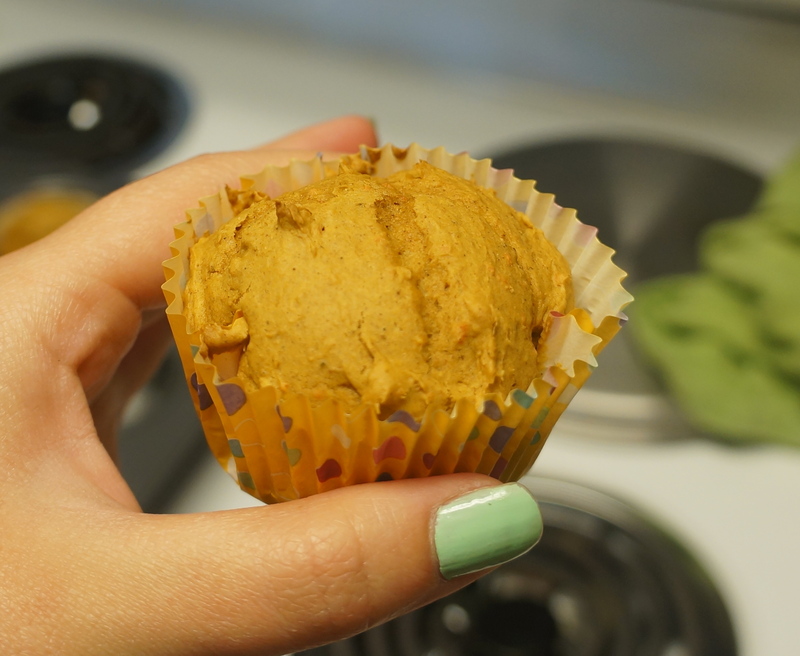 In order to satisfy our craving, we decided to make pumpkin muffins. Not only do they make our dorm smell fantastic, but they also happen to be the easiest baked goods to make in the history of baked goods. Yup- It’s really only two ingredients! We told you it was easy! Now, you need to actually make the muffins. 1) Preheat your oven to the temperature specified on the box of cake mix (for us it was 350 degrees). Spray the cupcake pan with Pam or use cupcake sleeves. 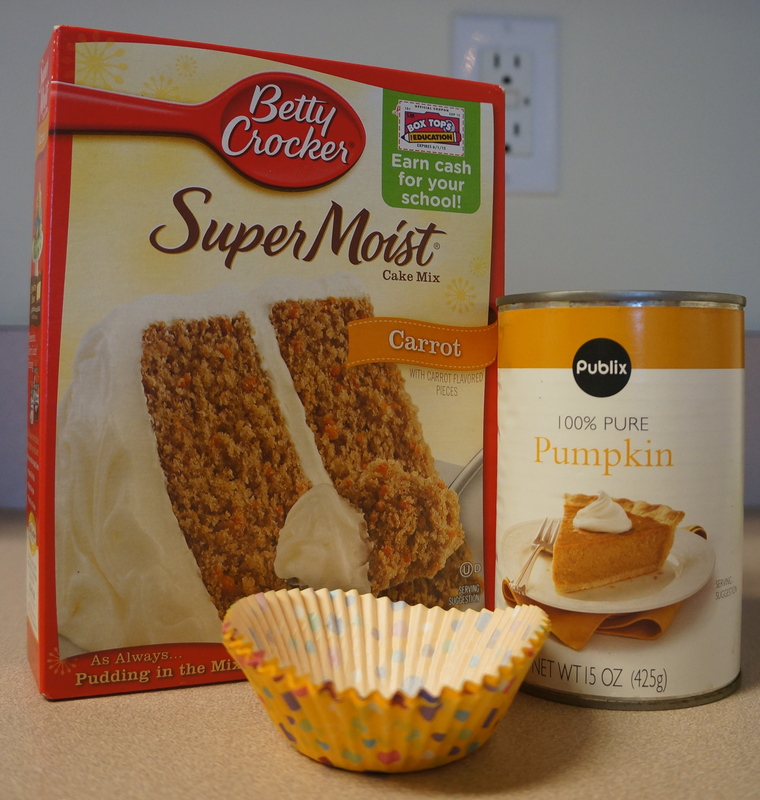 2) Pour the cake mix and pumpkin into a large mixing bowl. 3) Use a large spoon to stir the pumpkin and mix together, just enough so the mix is damp. This step is just to make sure the cake mix doesn’t fly everywhere when you use the hand mixer. 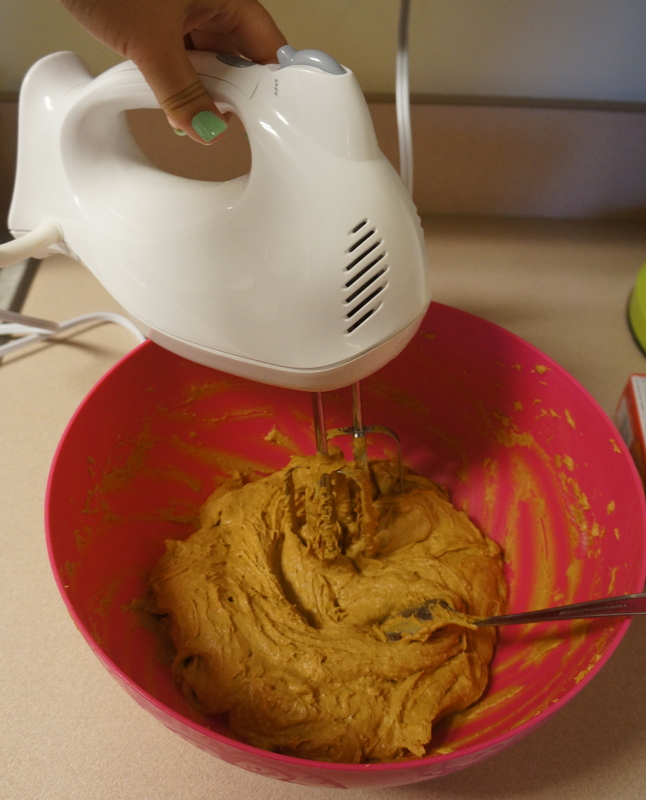 4) Using an electric hand mixer, beat the batter as specified on the cake mix box. We beat our batter at low speed for 30 seconds, then high speed for 2 minutes. 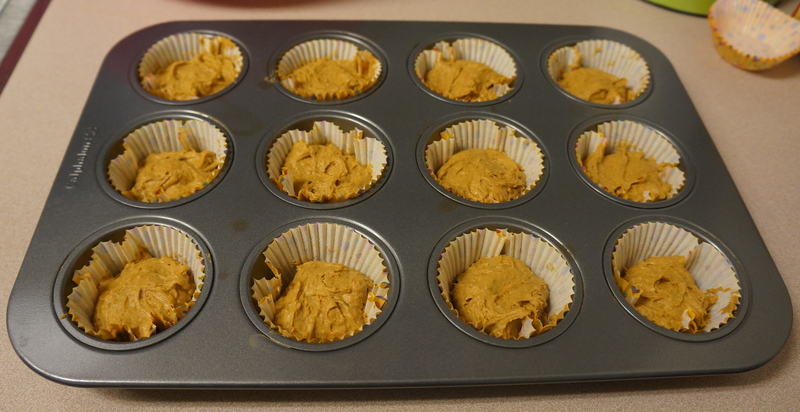 5) Pour the batter into the cupcake pan, filling each spot 2/3 of the way full. 6) Bake the batter according to the time specified on the box (for us, 20 minutes). 7) Let them cool, pop them out, and enjoy your autumn-themed treat!! This recipe can also be poured into loaf pans or cake pans and makes a wonderful Pumpkin Bread! So this shenanigan actually was a success? Bravo! Easy recipe too. FYI I prefer Duncan Hines to any other cake mix. This was actually Amelia’s recipe that she used to make at home, but it is easy and awesome so we thought we would share it! And Duncan Hines works great too, just make sure not to buy the one with pieces of carrots in it, unless you want chunks of carrots in your pumpkin bread. These were so easy, and great for anytime of the year!!! A great treat for the Thanksgiving holiday! Were these dry at all? I’d be nervous since there was no other liquid or eggs. They aren’t the most moist of all muffins, but they are still very very good. I think that something in the can of pumpkin takes away the dryness (also make sure that you don’t over cook them). They are especially awesome if you add creme cheese icing!